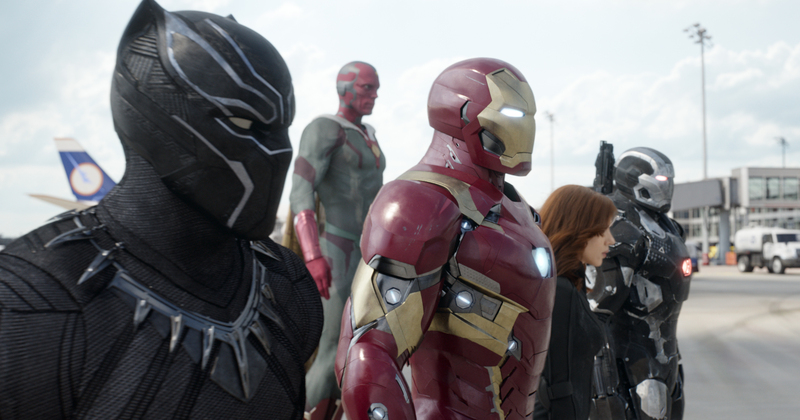 Walt Disney Studios’ Captain America: Civil War held on to lead the box office a second straight weekend (May 13-15) with $72.64 million from 4,226 theaters. The blockbuster superhero sequel starring Chris Evans, Robert Downey Jr. and Scarlett Johansson earned the eighth-highest second weekend take of all time, or the 19th-highest second weekend when adjusting for inflation. The film’s 59.5 percent decline from its debut weekend was in line with the 59 percent second-weekend decline of last year’s Avengers: Age of Ultron, the 57 percent decline of 2014’s Captain America: The Winter Soldier and the 58 percent decline of 2013’s Iron Man 3. With $295.97 million through 10 days of release, Captain America: Civil War has registered the seventh-highest 10-day start of all time, or 14th-highest when adjusting for inflation. The film is running 6 percent behind the $313.40 million 10-day gross of Avengers: Age of Ultron, 86 percent ahead of the $158.88 million 10-day take of Captain America: The Winter Soldier and 4 percent ahead of the $284.94 million 10-day start of Iron Man 3. Disney held the top two spots for the second straight weekend, as The Jungle Book held the second spot with $17.12 million in 3,970 theaters. The blockbuster live-action computer animated hybrid declined a modest 30 percent from the previous weekend, stabilizing after the 44 percent drop it took the prior weekend when up it went against the opening of Civil War. The Jungle Book has now grossed $311.11 million through 31 days of release. New release Money Monster starring George Clooney and Julia Roberts debuted in third place with $14.79 million in 3,104 theaters. Sony Pictures/TriStar’s adult drama thriller directed by Jodie Foster opened 32 percent ahead of the $11.35 million opening for Clooney’s last release Hail Caesar! in February, 32 percent behind the $22.00 million opening of his 2014 film The Monuments Men and 42 percent ahead of the $10.53 million opening for last year’s finance-themed The Big Short. Although the film has received mixed reviews, no true adult dramas will be released for another month as the thick of the summer movie season arrives in earnest, potentially allowing Money Monster to corner that segment of the market. High Top Releasing’s horror flick The Darkness opened in fourth place with a modest $4.95 million in 1,755 theaters, about in line with low expectations. The supernatural horror film stars Kevin Bacon . Open Road’s Mother’s Day tumbled a tremendous 71 percent to gross $3.29 million in fifth place on 3,291 screens. The sharp decline was inevitable given film’s namesake holiday arriving the previous weekend. The movie has earned $28.79 million through 17 days of release. That puts it 12 percent behind the $32.65 million 17-day total for 2011’s New Year’s Eve, which was also directed by Garry Marshall, although that film’s namesake holiday had not yet arrived by the equivalent point in its run, and a substantial 71 percent behind the $99.91 million 17-day total for 2010’s Valentine’s Day. Elsewhere last weekend, Disney’s Zootopia claimed sixth place by falling a negligible 12 percent to earn $2.83 million in 1,935 theaters. That brings its total to $331.84 million in 73 days, and marked its first weekend ranking outside the top five. Only Star Wars: The Force Awakens spent more weekends in the top five in the past year. Universal Pictures’ The Huntsman: Winter’s War tumbled 33 percent to earn $2.63 million from 2,518 theaters. That brings its total to a disappointing $44.59 million in 24 days, or 67.5 percent behind the $137.12 million 24-day take of 2012’s Snow White and the Huntsman. The Warner Bros. Pictures’ comedy Keanu fell 41 percent to make $1.92 million in 2,120 theaters, for a disappointing total of $18.64 million in 17 days. This coming weekend will see three major wide release: Sony/Columbia’s animated The Angry Birds Movie, Universal’s R-rated comedy Neighbors 2: Sorority Rising and the Warner Bros. comedy thriller The Nice Guys.